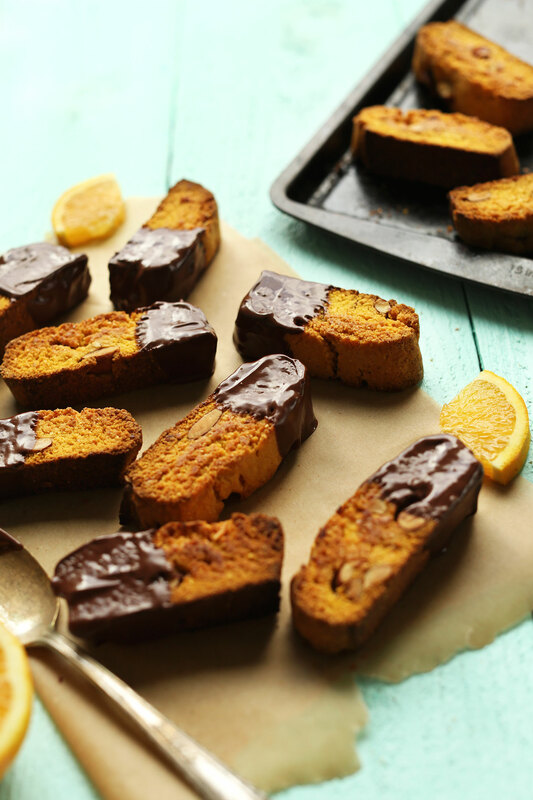 Friends, are you ready for vegan biscotti perfection? Because that’s exactly what’s about to go down. When I imagine a dreamy, idyllic morning, it involves a hot drink of some kind, biscotti, and sitting by a window with my journal or a good book. Oh, and obviously stretchy pants and an oversized sweater are involved. That’s a given. 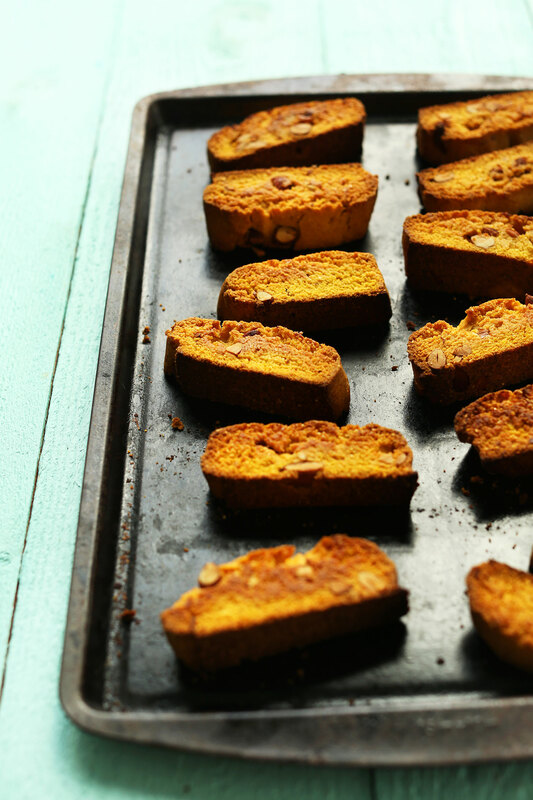 A reader requested I make vegan biscotti (hi, Aditi! ), and I thought it was such a great idea. In my research, I learned biscotti means “twice baked” in Italian. And, as you might’ve guessed, this crunchy cookie traditionally enjoyed with a hot beverage originates from Italy – swoon. My girl, Giada, knows what’s up. 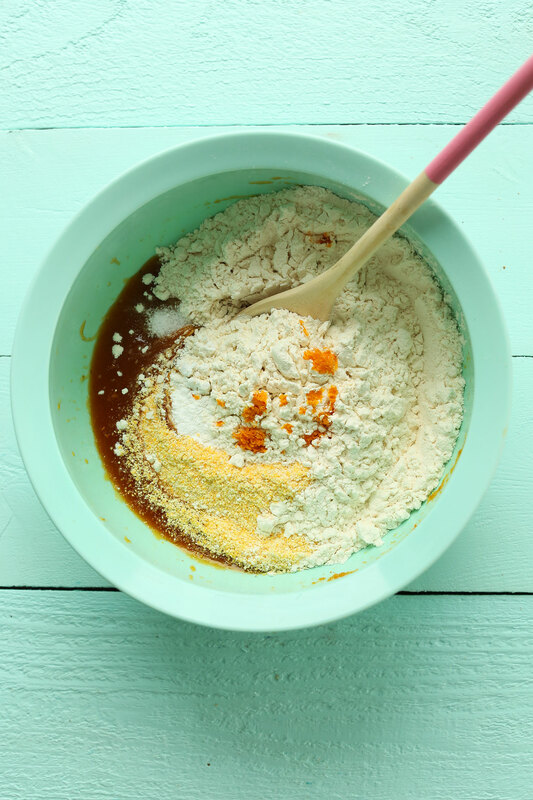 This recipe is simple to make, requiring just 1 bowl and 10 ingredients! It’s also made with coconut oil and sweetened with organic cane sugar (sub coconut sugar if you’d like!). If you’ve never made biscotti, the concept is very straightforward. 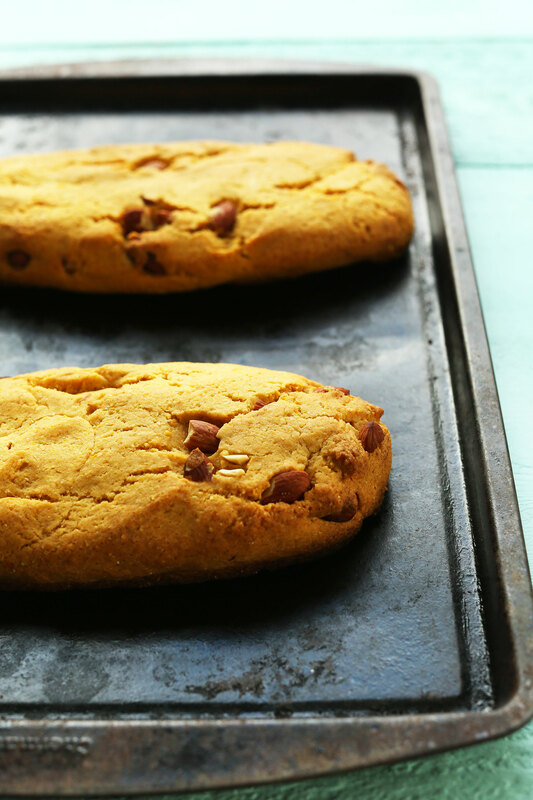 Make a cookie dough, shape it into two logs, bake until slightly golden brown, and cool. Then slice into small segments and bake once more. That’s it! That is, unless you want to dip these beauties into dark chocolate (and why wouldn’t you want to do that, I ask?). These would make the perfect treat to go alongside your favorite hot beverage in the morning, or for an evening dessert. A perfect pairing would be my 5-minute Vegan Hot Cocoa, or my 3-Ingredient Ginger Latte. Serious yum. If you give this recipe a try, let us know what you think! Leave a comment, rate it (once you’ve tried it), and don’t forget to take a picture and tag it #minimalistbaker on Instagram. We’d love to see what you come up with. Cheers, friends! 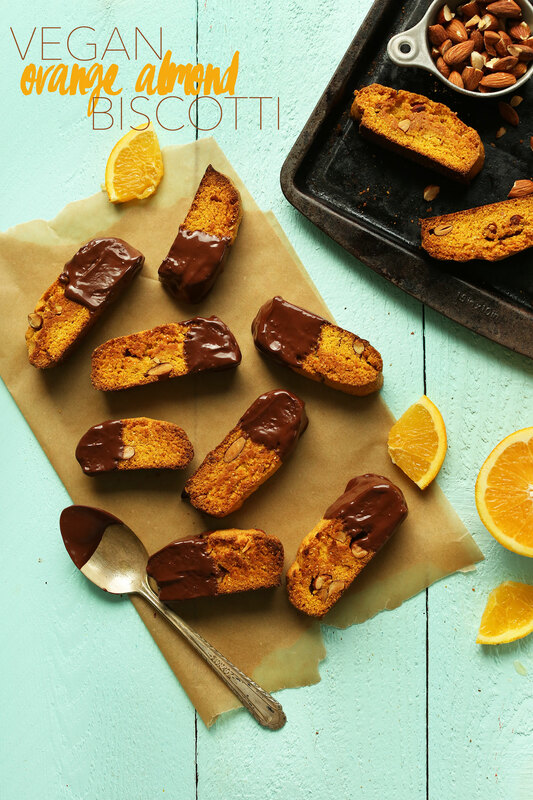 Amazing, simple vegan biscotti infused with orange zest and roasted almonds. Dip in vegan dark chocolate for a decadent touch. A delicious vegan breakfast, dessert, or snack with your favorite hot beverage! Melt coconut oil in a large mixing bowl. Add organic cane sugar and whisk thoroughly to combine. Add pumpkin puree and vanilla and whisk until completely combined. Next add flour, cornmeal, baking powder, salt, and orange zest. Stir until combined, but try not to over-mix. Add almonds and stir once more to evenly disperse. Use a knife or spatula to divide the dough into two even sections (amount as original recipe is written // adjust if altering batch size). Then using damp hands, form the two portions into long, semi-skinny logs (see photo). Try and make them as uniform in size and shape as possible so they bake evenly. Bake the loaves for 25-30 minutes, or until just slightly brown on the edges. Let cool slightly on the baking sheet, then use a serrated knife to gently slice into 3/4-inch pieces. Be very gentle when slicing, especially where the almonds are as they can crumble easily. I discarded (ate) the very end pieces because they were too small and already quite brown. 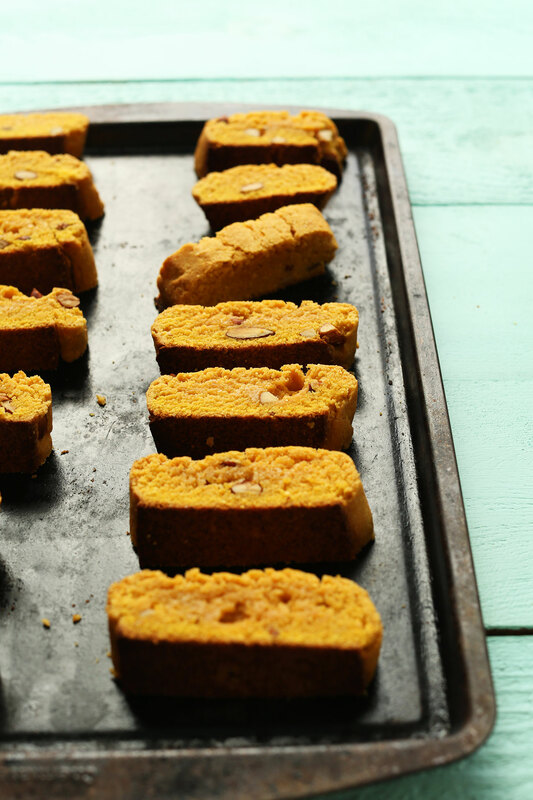 Gently turn the biscotti on their sides and return to the oven to bake for another 20 minutes, gently flipping once at the halfway point (10 minutes), to ensure even baking. Let cool briefly before enjoying. If dipping in chocolate, add chopped chocolate to a mixing bowl and microwave in 30 second increments until melted, or melt over a double boiler on the stovetop. 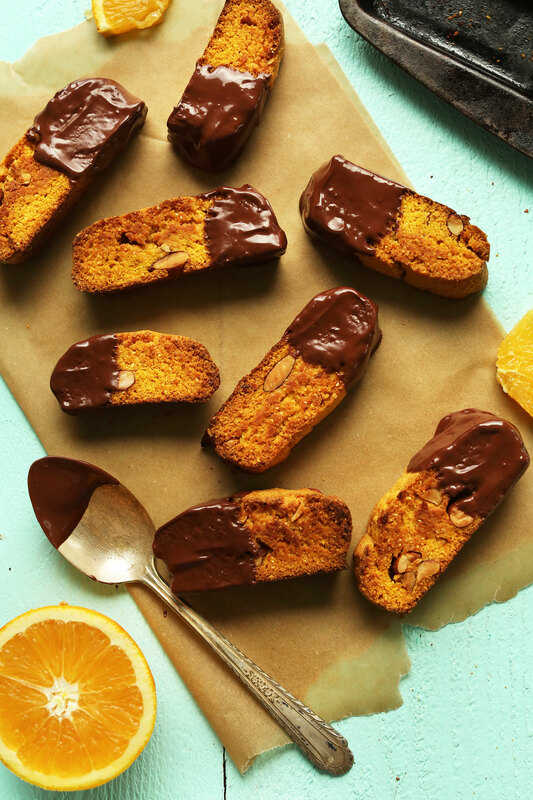 Once the biscotti are slightly cooled, dip one half of the biscotti into the chocolate, use a spoon to spread it slightly, then scrape off the excess. Place on a parchment-lined baking sheet to dry. To speed setting, pop in the freezer. Otherwise, let dry at room temperature until completely set. Store covered at room temperature for 3-4 days (I found a large jar is ideal). Will keep well-sealed in the freezer for up to 1 month. Enjoy with hot tea, hot toddies, hot chocolate, ginger lattes, or chai latte! *The pumpkin puree is a substitute for eggs in this recipe. If you eat eggs, sub 2 large eggs (amount as original recipe is written // adjust if altering batch size). Otherwise, suitable alternatives might be mashed banana for a “banana bread” flavor, or applesauce. However, I haven’t tested any other substitutions and cannot guarantee the results. *Sub up to half of the unbleached all-purpose flour with spelt or white whole-wheat flour for a healthier biscotti. However, this will make them a bit more dense and rustic in flavor. *If your almonds are raw, toast in a 350 degree F (176 C) oven until golden brown, fragrant and the skins are beginning to pop - about 10-12 minutes. *Recipe loosely adapted from Epicurious and Giada De Laurentiis. *Nutrition information is a rough estimate calculated without chocolate. I never made biscotti before and can’t believe how easy this is to make. They came out just like the photo. Can’t wait to serve them to my guests tonight. I had one with my coffee this morning and they are delicious! Thank you! These came out great. I used all of an orange peel, more like a tablespoon, and almond extract instead of the vanilla and I used white whole wheat flour instead of the unbleached. It was still easy to slice. My husband said they tasted better than the non vegan biscotti he had purchased! Even my non-vegan husband said “very good”! I used veg. oil instead of coconut and added about 1/2 tsp almond flavoring. Also, I had some winter squash in the fridge that I used instead of pumpkin. Next time I would put in less sugar – maybe 1/2 cup. Did not use chocolate. I made 2 10-11″ logs and probably cut them into 3/4″ cookies. I got 26. I used a silicone baking mat. Next time I will skip that for the toasting step as I think they should be a little more browned. My first time making biscotti! Thanks! We did half olive oil, half tehina instead of coconut oil, and a 1/2 cup maple syrup instead of the sugar. (Also added a little anise, which paired so nicely with all the flavors here.) They were fantastic, and definitely will become a repeat breakfast treat! This recipe is super-simple to follow and the results were delicious! I loved the addition of orange rind – it really added to the flavor. I coated the biscotti with some gourmet orange-cranberry chocolate that I bought at a local coffee shop – oh yeah! Thanks for posting this great recipe! Is it possible to use olive oil in place of coconut oil? Or would that do something weird with the flavour/texture? Very easy dough to work with. I will try substituting almond extract for the vanilla next time. My daughter who is egg allergic had told me she needed to make biscotti’s for her Italian class. I decided to google egg fee biscotti before trying to convert a classic recipe by using an egg substitute. Many different recipes came up but when I read this recipe I decided to test it out, I had to leave out the almonds for tree allergy reasons and also did not have an orange on hand either. So I substituted the zest for some orange and anise extract. These biscottis were just incredible. The consistency of the dough was perfect and they were easy to cut. My daughter and her friends recorded themselves making a batch in their own. I am proud to say that their batch came out just as good! They were easy to slice too! Will be baking these for awhile! We are so glad to hear that, Yvonne! If you could leave a star rating, that would help us a lot! Yum! That sounds delicious, Dorota! Did you end up adding the 1/4 cup of cold water? I was wondering if you think silken tofu purée would be an ok sub for the pumpkin purée? Hi Coral! That could work, though we haven’t tested any other substitutions and cannot guarantee the result. If you experiment with it, report back on how it goes! this looks so good! is there a good way to make it gluten free? I’m sure there is, but we haven’t tried that ourselves. We’d recommend starting with our gluten-free flour blend! Thank you so much for this! I eat biscotti (or a quarter of one) everyday with my coffee. It’s my favorite thing, and it was very hard to give it up when I changed to a Vegan diet. Tracking my food today, I was wondering what food was adding cholesterol to my macros?? I looked, and for a small piece of one cookie, I had 4 grams of cholesterol. I immediately came on line and found this recipe, and I cannot wait to try it. Thank you!!! Oh ok sorry!! :) I got it mixed up/read & commented too fast there!! Nothing wrong with the Celsius. I followed the recipe exactly and was overall happy. I do wish the almond and orange flavors were stronger. Here are some notes. – I loved the texture from the cornmeal. I used yellow cornmeal straight off the shelf, I don’t think it was especially finely ground. – Next time I’ll use more orange zest or maybe juice or extract, I’m not sure. I’d like the orange flavor to be much more pronounced. – I pulsed the almonds in a food processor so my toddler could eat these easily. I might add more next time or some extract to have a stronger flavor. I made this recipe awhile ago, and started to panic when I couldn’t find it in my recipe box, (yes, I still have an actual recipe box!) Thank goodness I found it again! I love your recipes and site. You never let me down! We’re glad to hear you enjoyed it, Nicole! I followed the instructions exactly but the dough is very crumbly and isn’t close to being moist enough to stay together and roll into a log. Is there a missing ingredient? I am an experienced baker. I will add pumpkin…..
I’m sorry the recipe is being finicky for you! Others have had this issue it seems as well but it seems that pumpkin will help improve the consistency! I just pulled these out of the oven 10mins ago. They are fabulous!! Easy peasy and super tasty. I wasn’t sure about the orange zest, but it’s delicious. Tomorrow mom going to melt some chocolate and dip these babies. I think these are going to become a favorite “cookie” for gifting. Thanks! I don’t consider myself a biscotti person. They’re always too hard. But these are AMAZING. I made them for an event I hosted and everyone loved them. They’re easy, just the right consistency even at high altitude, and the flavor is perfect. I used the zest of a full size orange and the flavor was perfect. Made this this morning and they’re already gone… SO GOOD!!! Sooo Good! I made this and my family stated restraunt quality and has requested more ASAP! . I added a small amount of banana extract to the recipe as well. We ate half of them and froze the rest so that they stayed fresh. Thanks for the biscotti recipe! For the gluten-free folks, please know that I used the Bob’s Red Mill baking mix 1:1 and it was just fine. Overall I thought the dough was a bit too crumbly and dry, so I instead of wetting my hands with water, I smothered them in pumpkin puree as I was shaping the loaves for their first bake. Worked pretty well and still can’t taste pumpkin (probably only added 1/3-1/2 c more). I baked for the recommended time and they turned out nicely. If you prefer a crunchier biscotti, perhaps leave them in a bit longer than 20 minutes in second bake. If I were to bake these again, I’d probably add dried cranberries or cherries, just to give it a little more tartness, and perhaps stick to almonds/walnuts/pecans to give it a heartier texture (or do half sesame seeds, half nuts). Wonderful! Loved these. I used applesauce in place of pumpkin purée and it worked very well. Question: Possible to substitute almond flour for the wheat flour? I know almond flour adds moisture and fat, so am wondering about proportions. Thank you for your fantastic recipes. Awesome recipe – thank you! Finally homemade biscotti…. Hello! I made this cookie and I and my family loved it. I used whole wheat flour instead of white and I used sunflower oil instead of coconut oil. He did not get the orange color because I used the whole flour but no problem because it was very good. Congratulations! just pulled these out of the oven and my house smells delicious! i subbed toasted walnut halves for chopped almonds, orange flower water for vanilla, and applesauce for the canned pumpkin. thought about tossing them (while still warm) in a mixture of cinnamon and sugar…or maybe a drizzle of white chocolate…? one thing’s for certain, lady. your recipes never disappoint!!! Just made these with 2 little adjustments; I used hazelnuts instead of almonds and I also added an additional half cup of pumpkin because my mix was really dry. They came out perfect! still can’t detect the pumpkin even though I added more, plus I love how the orange zest plays off the dark chocolate drizzle. These are awesome, will most definitely make again. These were absolutely delicious. Only one thing is that I forgot to add the cornmeal/cornflour, could this be a reason they were a bit tricky to slice (couldn’t decide whether it was better to use a serrated knife or not) you know getting stuck on the delicious almonds. Anyway, they turned out perfectly and were well loved by all even with my booboo. Love the use of pumpkin puree, I just happened to have a tin lying around! Just made these for a friend and I had to taste a few for quality control of course. I dipped them in melted vegan dark chocolate and they are really delicious. The pumpkin purée can’t be tasted but it works great as a binder. This recipe is going to be my new standby and I can always incorporate other add-ins instead of orange zest and almonds if i want. I’m thinking cranberry and pistachio next with some white chocolate. The house smelled so good when they were in the oven. Thanks for a great recipe. I have made these biscottis multiple times and they always always ALWAYS turn out GREAT! You’re a genius :) Thanks! Really declicious and was a hit with my other family members as well! I used eggs, olive oil and only half cup of sugar. Felt the sweetness was just nice and could even be reduced slightly more. Only thing was many of the biscotti broke when I was slicing them, maybe I needed to knead the dough more, but this did not affect the taste anyway. First receipe I tried and I’m a total convert! I made these last night and they were fab!! I accidentally forgot to chop the almonds (d’oh!) so they were in there whole but turned out fine none the less. I used 100% all purpose flour and added a whole scraped vanilla bean to the dough (I also added more orange zest because, well…orange). This is the first time I’ve made biscotti and I’m thrilled with the results. I took most of them to work this morning and my coworkers were equally appreciative of the results. Thanks! These turned out really great. I used chocolate chips instead of almonds- so I can send them to school with my kids- nut free school. And I used almond extract instead of vanilla- but not as much since almond is a stronger flavour. Will make these again! Thank you for sharing! These are sensational! This was my first time making biscotti and my oh my were they good! I love this recipe. Have made it twice now and results are delicious. You would never guess pumpkin puree is involved. Thank you! I have no idea why you wouldn’t dip these in chocolate. I mean – surely EVERYTHING is better dipped in chocolate. Biscotti, strawberry, apple, peanut butter cookies, hummus, spaghetti bolognaise…. I am excited to make these! Have you made them without nuts? Curious how that will work out, and if I need to substitute anything if I am leaving the nuts out. Fantastic! I’ve made this twice. My husband LOVES this biscotti. Thank you, Dana. I made this and the dough was really crumbly! I persevered, but even after the first bake and cutting them as gently as I could the dough still crumbled everywhere – do you know why this might be? I followed the recipe exactly! Some of them have held together but most have fallen apart, they taste amazing though! This is an amazing recipe1 My husband hated biscotti before until I made this. I made this and it was just incredible! I did have to make a couple of substitutions, for some reason I had to add almost 3x sweet potato puree and extra olive oil to make it into a wet dough, but it still turned out great! The orange zest was such an amazing touch. I made these and they were so delicious! Thank you so much for your recipes. Ding, ding, ding. Another AWESOME winner. How I managed to make 1/2 a recipe last over a week is beyond me. Extreme discipline not to eat them all at once! Why do I love this recipe so much?? I made it earlier this week for my vegan daughter – subbing in half whole wheat flour. They were so good!! I have never been a biscotti person before – they always tasted stale to me – I didn’t get the attraction. But when you make yourself? Wow. Well I thought my GF husband should get a chance to try them so I have a GF version in the oven right now. I was out of oranges and almonds (as we have a blizzard here on the East Coast right now and going to the store is not happening) so I’ve subbed in lemon zest and pecans. The only difference so far is that the GF batter was much wetter so I had to add extra GF flour – probably about a 1/3 of a cup until I had the right, stiff consistency needed. I’ll let you know how they come out! What has me really excited are the possibilities going forward just alternating zests and nuts. How does Lime Macadamia Nut Biscotti sound? I’m making these every week forever. Thank you Dana!! Dana, you are amazing! I am inlove with your recipes. I make something everyday! The biscottis were phenomenal. Today I made to toasted coconut oatmeal. Love love love this recipe! I made this one and one of your bread recipes in the same day and they both turned out wonderful! I did substitute a few ingredients because I didn’t have everything on hand, but it still turned out amazing! This is probably my new favorite recipe! I forgot to mention, I was jumping onto your blog to look for a chocolate chip cookie recipe, and I like mine crunchy- which I have not been successful with baking at home, and lo and behold this recipe was staring me in the face when I opened the page! Fate! And I do love biscotti but never knew how to make it….it is just like the crunchy cookie I adore! Gah, the pictures make my heart flutter. They’re so beautiful! I love the orange chocolate combo. I ate one today, and the combination of orange, toasted almonds, and chocolate had me savoring every bite! Since I didn’t have coconut oil, I used olive oil. For the entire amount of all-purpose flour, I subbed whole-wheat, and used mashed sweet potato instead of pumpkin, adding a bit more sweet potato until it all came together. I can’t wait to eat another one—preferably, with a cup of coffee brewed from the chocolate-orange flavored coffee beans I got for Christmas. Thanks, Dana, for another incredible recipe! Wonderful substitutions! Thanks for sharing!! These were amazing! So easy and delicious. I used walnut pieces instead since that’s what I had around. Loved this! These look yummy, and I’d love to try it, but was wondering if there’s a gluten free substitution for the white flour? I ate some oranges recently that I had the intuition to zest before peeling.. looks like the zest was meant for this recipe. ;-) Thanks! Hi Joanne! As I mentioned in the above comments, I haven’t tried it myself, but if I were to try it, I’d sub the All Purpose for Bob’s Red Mill 1:1 gluten free blend! Good luck and report back if you try it! What a yummy vegan treat! I just made these and they are amazing!!!! I have a feeling they will be making a regular appearance in my house. I love making things from your site because I know they will always turn out just as you say they will. Dana these look soo yummy! Can’t wait to try them! I saw on Instagram that this recipe was now on your blog and I had to make them NOW. So I made them and they are pretty delicious! 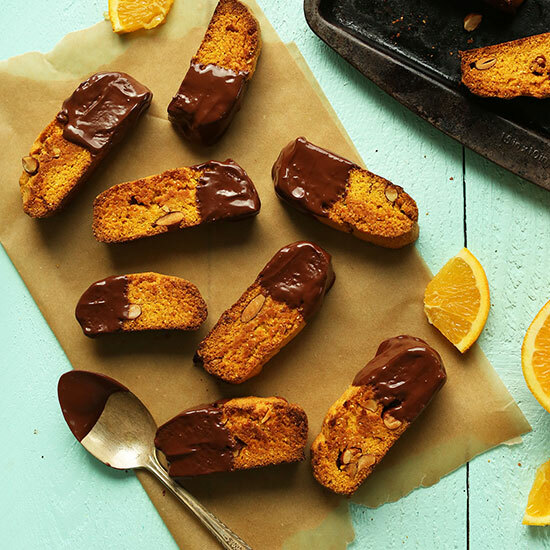 I had to substitute the orange zest for clementine juice (I just discovered you can’t zest clementines) because of the urge to bake biscotti and the lazyness to go to the grocery store and they turn out good! Can’t wait to make “the real thing” next time! Thanks for the recipe! Used homemade Apple sauce (100g) instead of pumpkin purée- worked a treat. Trying to keep these til xmas will be hard!! Oooer pumpkin puree! That was a surprise ingredient I wasn’t expecting :) Do you think it has enough of a binding action for me to sub in whole wheat/spelt flour for the all purpose? I think so! Let me know if you give that a try (spelt being the better option). Gluten free? Bob’s Red Mill 1-1? What do you think. These look so yummy! Thanks Dana. I will try this one day this week. nanners as a sub 4 pumpkin. She must mean mgs, not grams. Hi can all purpose gluten free flour be used in this recipe? Hi Jill! I think so, but I haven’t tried that myself. Let me know if you do! Love that these contain pumpkin puree and coconut oil, and no eggs – just simple ingredients. I might have to start baking again. The pumpkin puree surprises me the most here! Worst baker ever. Fingers pointing toward me. But I’d love to make biscotti, it’s so tasty. Lots of Italian neighbors and friends, live in an Italian neighborhood. Most fun parties ever!!!!!! Boy, can they all cook. Oh well. If you don’t try, you don’t know if you can do it! OMG! These are getting made (and likely consumed) today. Thanks, Dana.